It’s now time to visit The Old Mansion and find out more about Roxas. You now know about Lucky Emblems so be sure to keep an eye out for those and take pictures of them. First off, grab the nearby Treasure Chest on your right next to the “Now Showing” sign to get the map for this world. Afterward, you can climb up the wall behind that chest to go on the roof and find another chest on your left. A third chest can be found up the wall on the left of the Bistro. 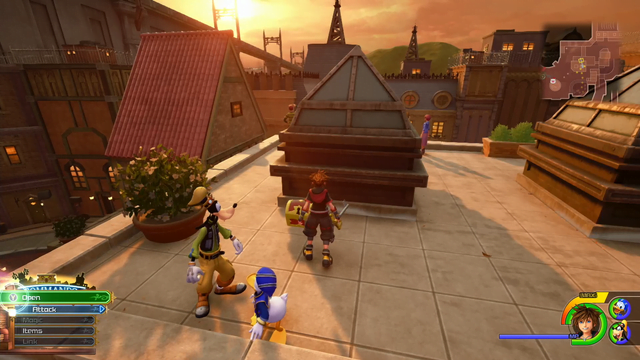 There is a little outdoor theatre on the opposite northern side of Twilight Town. You can find a chest in the northeastern corner there. Now, it’s time to find The Old Mansion. Head to the southeast corner of Twilight Town and you will see a section of the ground that you can jump down to. This will take you to the underground area. Behind the entrance to this area are some breakable crates that you can break to find another chest. Follow the Underground Conduit area down its linear path. You will encounter a couple of enemies as you travel along that doesn’t take much to take them out. Once you reach the exit of the Underground Conduit, there is another chest in the corner. You will find yourself in the woods. A cutscene will happen and you are now in a fight with some monkey-like Heartless to save a little rat. 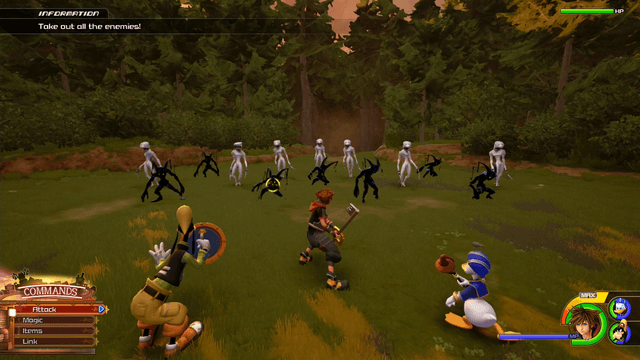 These Heartless are really easy to defeat so all you need to do is use Links or attractions to take them out. They will dodge and climb trees so area attacks are recommended. After this fight, continue on into the woods to fight some more Heartless. After you have cleared the area of enemies, go to the left of this main part of the Woods and you will find a chest atop a fallen tree. There is another chest that is straight ahead of the exit from the Underground Conduit that is slightly hidden by a tree. There is one last chest in the woods that is on the opposite side of this area on the east side. The chest is behind a fallen tree on a ledge. With that, continue down the main path out of the woods to The Old Mansion. Grab the final chest in this world to the right of the entrance to the mansion and head in when you’re ready. After a good bit of cutscenes, walk out the gate and you will have another cutscene. You will then have yourself a fight against a lot of Nobodies. These enemies are pretty standard so continue to use Links and your team attacks with Donald and Goofy to make short work of these enemies. 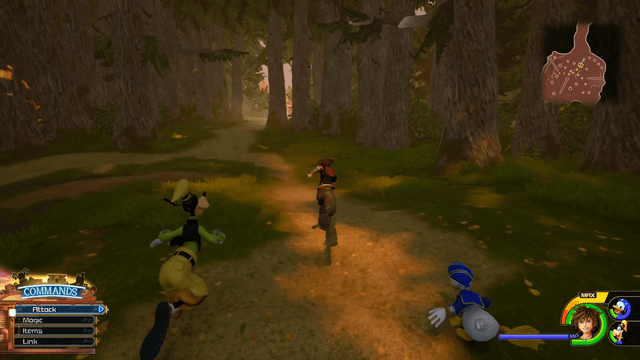 Make your way back through the woods and defeat any Heartless along the way. Then continue back the way you came through the Underground Conduit to reach Twilight Town again. 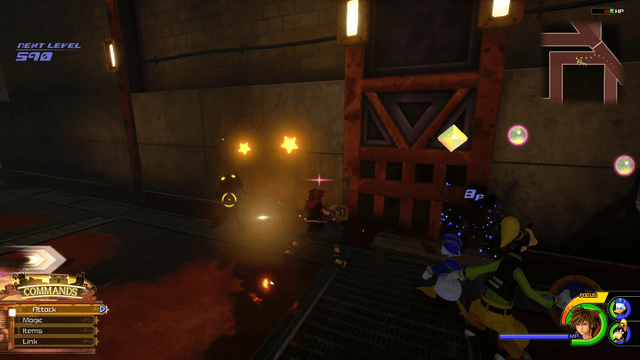 Climb up out of the underground area and another cutscene will start with Scrooge McDuck.